The Big Year is what you might call a hidden treasure of a movie. It’s going to slip under most people’s radar, but once they discover it, they’ll be glad they saw it and wonder why they hadn’t heard of it. After all, it stars Steven Martin, Jack Black and Owen Wilson. But the movie isn’t just an excuse to bring these comedic actors together. I didn’t know what it was about going in, but it actually tells a heartfelt and consequential story. Sure, it’s safe and saccharine-filled, but it’s able to be these things without pushing your buttons. 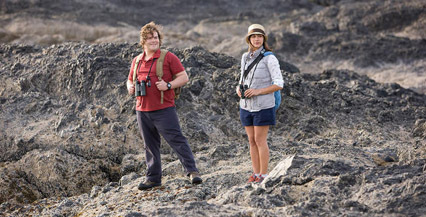 In the movie, The Big Year refers to the competition birders take part in to see who can spot the most species over one calendar year. The ritual began in England when bird hunters tried to kill as many birds as possible, but it evolved into simple bird watching and modern birders go to great lengths to participate, including traveling all around the world. The rules are that one need only see or hear a particular species and tabulate their encounters. Scoring is based purely on the honor system, which is probably why there’s no cash prize. Most birders find themselves competing for good old fashioned pride and adventure. Of course, some are more competitive than others, like Stu Preissler (Martin), Brad Harris (Black) and Kenny Bostick (Wilson). Stu is the CEO of a powerful New York City company and a workaholic. He’s already tried to retire twice, but this time he says it’s for real. His wife (JoBeth Williams) tells him it’s time for his Big Year because he’s dreamed about it for so long, which is generous of her considering they have a grandson on the way. Brad has less tying him down. He’s divorced and works as a systems analyst. His mom (Dianne Weist) supports his decision to try a Big Year but his dad (Brian Dennehy) wants him to settle down and do something more traditional. In other words, Dennehy plays one of those typical, old-fashioned movie dads who reproves his son for not doing what’s considered normal and proper. Kenny is married to the ever patient Jessica (Rosamund Pike), who’s eager to start a family, but even she has limits when Kenny lets his obsession for birding come between himself and other human beings. He currently holds the Big Year record but decides to do another one to see if he can surpass himself and maintain his title.